Valeria Mokeeva was born in St. Petersburg, 1958. She is originated from the famous Northern Russian bone-carver family, the Lopatkin. At first, Valeria studied the craft under the guidance of her mother, Svetlana Lopatkina. Later she got her degree in arts at the Academy of Arts, the class of drawing. Her grandmother, born before the October 1917 Revolution, urged Valeria to love the history and culture of the imperial St. Petersburg. 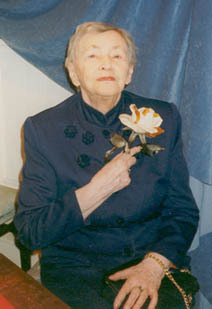 Valeria Mokeeva began her artistic and teaching career in 1982. She organised and headed the association of bone-carvers in then Leningrad, supported by the famous art historian N. V. Taranovskaya (the Russian Museum). In that period Valeria discovered the world of the old, pre-Revolutionary St. Petersburg for herself. Laces and crinolines, baroque and modern art, cosy and elegant life - all these mingle into a nostalgic dream, which embodied itself in tiny niceties that took Valeria away from the tough Soviet reality into the world of maiden reveries about the passed "Silver Age" of St. Petersburg. 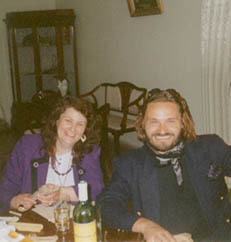 At the dawn of "perestroika", in 1987, Valeria met her second husband, Sergey Mokeev, and the two of them established their co-operative firm Petropol. Leaving the state support for the private business, Valeria had to subordinate her girlish fantasies to the reality of the market. She paid much attention to the organisation of the souvenir production and to educating of new carvers. and big financial figures from Moscow to Valeria's art and selfless devotion. Resulted, in 1990, with the support of one of the Moscow banks, Mokeeva set up an independent gallery "Petropol" in St. Petersburg. Since then, Valeria has fully revealed her talents as a researcher, artist and teacher. 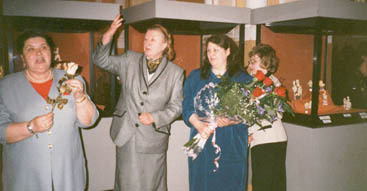 From 1990 to 1993 (the exhibition rooms of Petropol Gallery were opened in Millionnaya, 27), Valeria Mokeeva organised and held some conferences, an international one among them, with the support of the Hermitage and the Academy of Sinces. 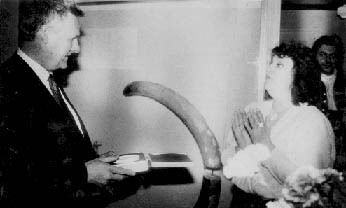 The conferences were devoted to the mammoth ivory in St. Petersburg and Russia. Mokeeva established an expert council at Petropol Gallery, the members of which became specialists from the Hermitage, Russian Museum and other prominent museums with collections of bone-carvings. artist V.I. Mokeeva, Ph.D. in Arts T.B. Arapova (Hermitage). Valeria Mokeeva hands to St. Petersburg Mayor A.A. Sobchak the first mammoth ivory medal "Peter the Great"
turned on the reconstructed Peter's medallic-copier lathe. 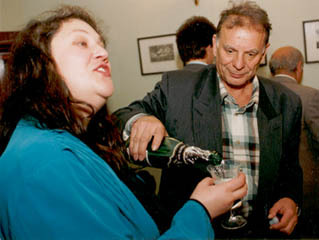 Petropol, 1993. Together with the Hermitage, she started the project "Theatrum Machinarum" aimed at the revival of the forgotten "ornamental turning", the favourite hobby of Peter the Great. Within this project, with the participation and under the guidance of Valeria Mokeeva, the ceremonial medallic-copier lathe of Peter the Great (1721) was reconstructed. The first stage of the project was crowned by the exhibition "Theatrum Machinarum, or the three epochs in the art of bone-carving in St. Petersburg", which was held in the Hermitage and in Petropol Gallery, 1993. The experience of reconstruction and her scholar researchers were published in serious editions and placed Mokeeva among the recognised experts in the field of traditional techniques in ivory. 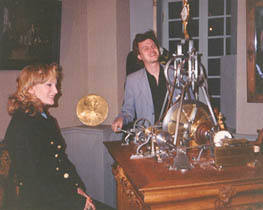 Patricia Kaas in Peter the Great's turnery in Petropol Gallery, 1994. 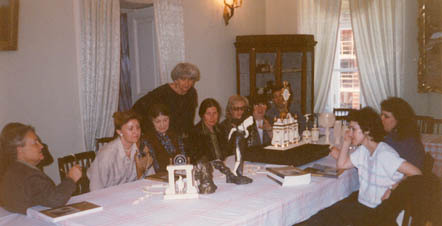 Valeria founded a school of interior sculpture and began to teach mammoth ivory sculpture to sculptors and students of different schools of arts. One of the most stunning events of her teaching became the triptych "Circles of Hell" by A. Antsiferova, the graduate of the Academy of Arts (M. Anikushin school), with the participation of Mokeeva, which was made in the technique of chrysoelephantine sculpture (the combination of cast bronze and mammoth ivory), for the first time in Russia. Petropol Gallery exposed the triptych "Circles of Hell" at the Moscow International Art Fair (Moscow, 1993), where it was highly estimated by experts and bought for the Moscow Kremlin Armoury collection at the price of US$ 40,000. Famous designer and collector Alexander Vassiliyev hands over bone fans to Valeria Mokeeva for the exhibition in Petropol Gallery, 1994. 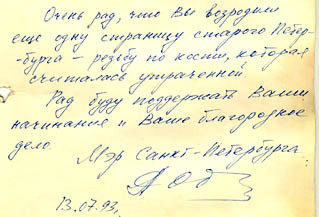 From 1993 Petropol Gallery was rapidly turning into one of the leading art galleries in Russia visited by famous politicians, businessmen, people of art and culture. The studio-school fulfilled the orders very efficiently. 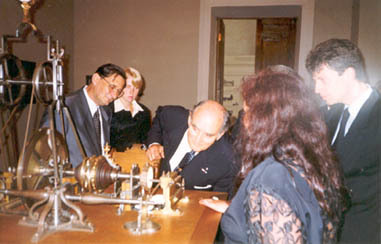 Doctor B. Dinger, Director of Deutsches Elfenbeinmuseum (Erbach, Germany), takes Mokeeva round her museum, 1994. 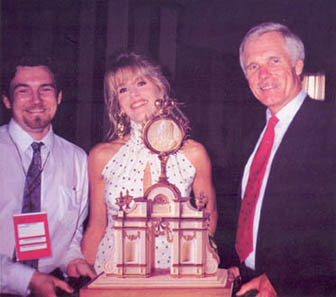 In 1994, Valeria Mokeeva with a team of restorers fulfilled the order of St. Petersburg city administration and created the "Triumphal Arch", which was handed to Ted Turner, the initiator of the Good Will Games-94, by Boris Yeltsin, President of Russia, and Anatoly Sobchak, Mayor of St. Petersburg. In 1994, 1996, 1998 a few pieces of ivory jewellery by Mokeeva were prizes at Maya Plisetskaya ballet competitions, on behalf of the city administration. In 1996, at President Yeltsin's inauguration, the city administration presented him with a carved box from the Petropol collection. The same year, on the order of Moscow Kremlin Museum, Valeria Mokeeva made a replica of Peter's "St. Andrew" medallion, which was handed as a gift to Swedish king Karl Gustav XVI in Kremlin. Sergey Mokeev, Ted Turner and Jane Fonda with the “Triumphal Arch” after the Good Will Games are over, St. Petersburg, 1994.
from Valeria Mokeeva to pass it over to Karl Gustav XVI, king of Sweden. Peter and Paul Fortress, 1999. 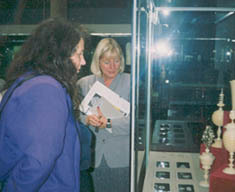 Within the "Theatrum Machinarum" project in 1994, Valeria Mokeeva initiated the reconstruction of the lost Peter's sacred "Life-Giving Cross with the Apostolic Faces on the Ark". 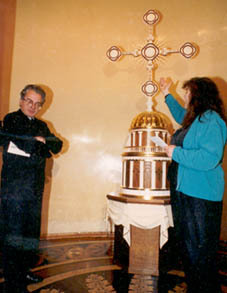 After the scientifically based reconstruction was accomplished, the "Life-Giving Cross" was exposed at the exhibitions of "Rose and Cross" in the Hermitage, 1995, and in Patriarch's Palace of Moscow Kremlin, 1996-1997. It was highly estimated by not only experts but also by Alexis II, Patriarch of Moscow and All Russia. On the eve of the burial of the remains of Nicholas II and his family, the "Life-Giving Cross" was moved to St. Peter and Paul's Cathedral in Peter and Paul's Fortress, St. Petersburg, where it was placed exactly at the spot that had been defined by Peter the Great himself. 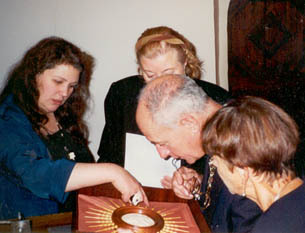 In 1999, Mokeeva made the medallion "St. Peter", a replica of one of the medals set on the "Life-Giving Cross", and handed it to Dimitry Romanovich Romanov, a representative of the House of Romanov, on the anniversary of the royal family remains burial. at the opening of the exhibition "Rose and Life-Giving Cross". new section of the exhibition “Rose and Cross”. Moscow Kremlin, 1996. While working on the traditional objects, Valeria did not forget about modern sculpturing. In 1995 she admitted a new group of students and founded the school "Ancient Cleft", where she started the chrysoelephantine direction. Valeria and her school created a series of avant-guardist works, so distinctive that the Hermitage and Moscow Kremlin Museum accepted them to the permanent exhibition "Rose and Cross", which Petropol Gallery held together with these museums. Four of the works were sent to present St Petersburg at the International Art Festival Art-GENDA'96 in Copenhagen, Denmark. The complete collection of the "Ancient Cleft" chrysoelephantine sculpture was exposed at 10th anniversary of Petropol Gallery in St. Petersburg and at the international art fair Art-Manezh'97 in Moscow. In 1998, Petropol Gallery was to present an "Ancient Cleft" collection at one of the world distinguished art fairs, ART-COLON-98 in Germany. Dr. 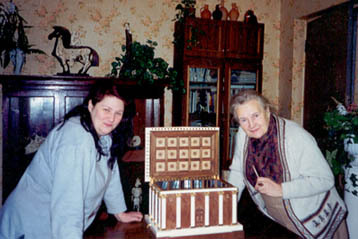 I. N. Ukhanova evaluates the “Pavlovsk Casket”. V. M. Golod, Chair of the St. Petersburg Collector s’ Club, at 10th anniversary of Petropol Gallery, with the “Rose” by Valeria Mokeeva. 1997. ALAS! After the Russian economical collapse in August 1998, Petropol Gallery had to go out business. Unfortunately, culture is a function of economy. Yet even after the crash of Petropol Gallery, within a year of fuss and despair, Valeria Mokeeva found sources of energy in her own self to start her life anew. She decided to work as an independent artist, unbound by any institution. The Russian and foreign art sociability has appreciated merits Valeria in business of development of art mammoth ivory. In August, 2000 Valeria have accepted in the members of The Society of Ornamental Turners (Great Britain), and in October, 2000 have accepted in the members of Union of the Designers of Russia. Her experience and world-known name let her find respectable customers abroad.